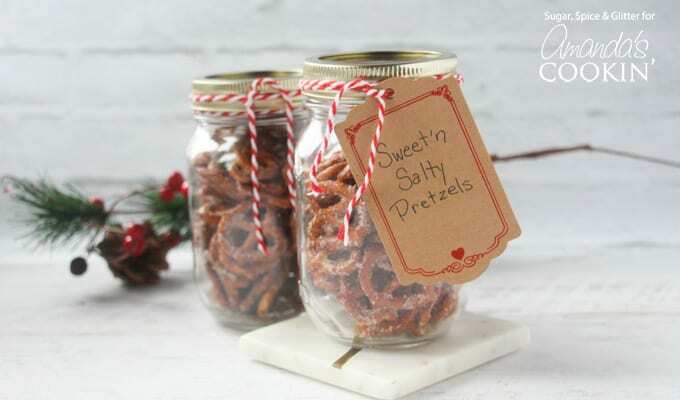 Sweet and Salty Pretzels in a Jar: a great gift idea for neighbors, teachers..
Mason Jar Gifts are such a cute and easy way to package almost any homemade treat. 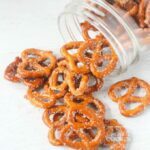 This year, my daughter will be bringing these Sweet’n Salty Pretzels to her lucky teachers and I’m going to share with you how you can treat the sweet & salty snack fans in your life to this tasty treat! I know I’m guilty of going into the Christmas season with grand ambitions in mind for what I’m going to make for everyone on my list… and then mid-December panic strikes as I realize I have maybe two gifts done and 20-something to go! So, this year I resolved to stick with easy, simple DIYs that could be made with my 5 year old and packaged easily in mason jars, like our No-Sugar Banana Bread Mason Jar Gifts or these Homemade Spice Rubs & Mason Jar Cocktails we made for my grill-enthusiast brother. No stress, no worrying about wrapping presents – just simple, homemade gifts that tray true to the heart of the holiday. After the pretzels are gone, the recipient can clean out the jar and use it however they’d like! Melt the coconut oil and stir in the hot sauce. Pour over the pretzels. 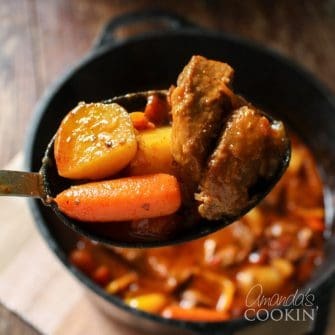 Stir to coat. 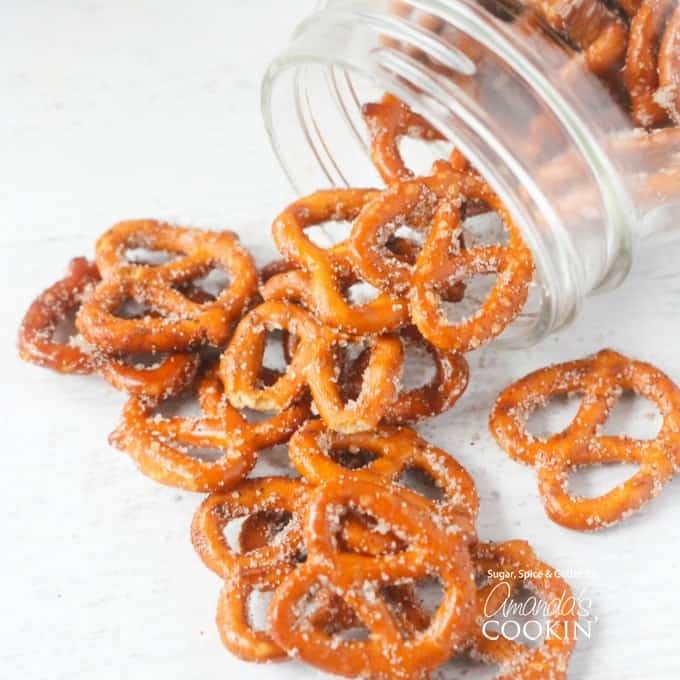 Mix the sugar and cinnamon together and then sprinkle over the pretzels, stirring to coat. Taste one pretzel to ensure you like the ratio of sweet and spicy/salty. Turn the pretzels out onto the baking sheet and distribute in an even layer. Bake for 10 minutes until the coconut oil has absorbed. Do you have a Sweet n’Salty fan in your life who would love this delicious homemade gift? 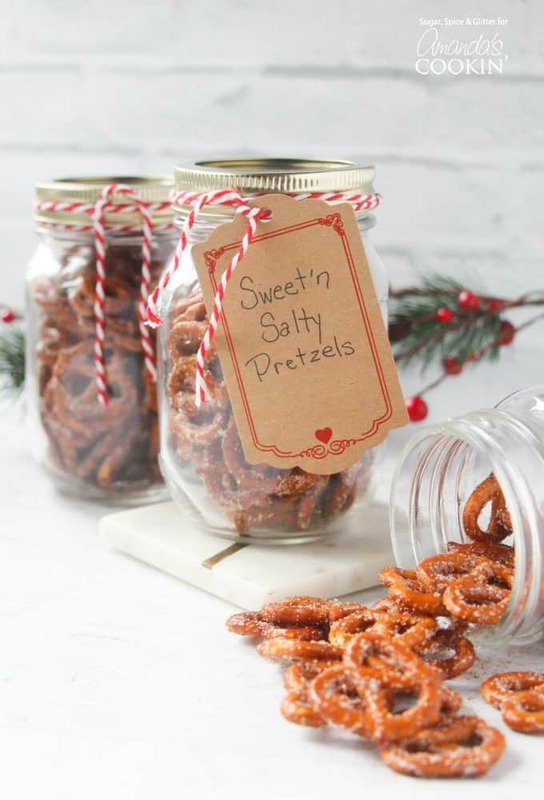 These sweet and salty pretzels are all packaged up to give as a gift. 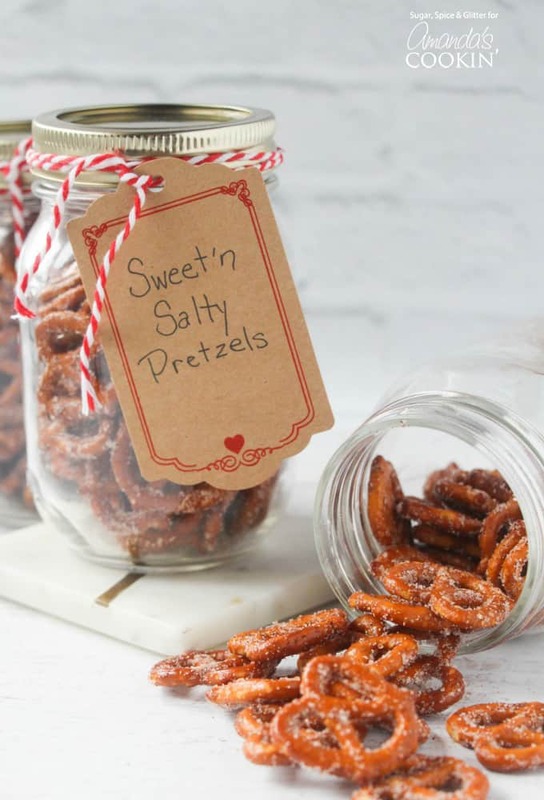 These pretzels in a jar are perfect for co-workers, friends, neighbors, teachers, etc. These are awesome! My daughter said she could eat them all day! I used sriracha, and highly recommend using the coconut oil. Really added, albeit subtle, to the flavor. Thank you for sharing!! So glad you enjoyed them Lisa! Thanks! Instead of coconut oil can you use something else, another type of oil? Yes, any neutral oil (like Canola) will work!